Includes: Jacket, Trousers, Shirt Front and Tie. 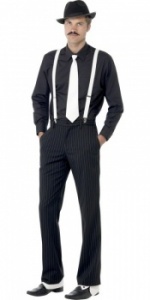 Includes: Top, Trousers, Mock Braces, Neck Tie and Hat. Includes: Jacket, Trousers, Shirt Front, Tie and Hat. 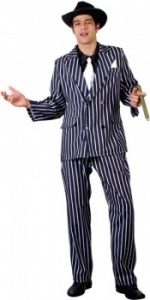 Check out our great range of Gangster Fancy Dress. 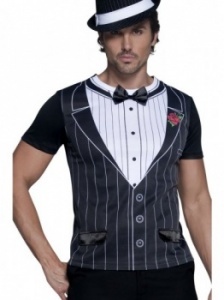 Men why not dress up in a traditional pinstripe suit and pretend to be a 1920's gangster. 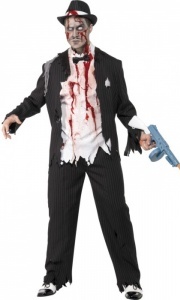 Why not accessorize your costume by purchasing a cigar, fedora hat, spats or even Tommy gun to make sure you finish off the gangster style look. Dress to impress and be the talk of the town in a cool pinstripe suit. Don't forget to purchase a pair of specs and Moustache.